You are suggested to take metro line 1 to reach Pingguoyuan Station by 08:00. Get out from Exit A and walk westwards for a few yards to find the stop of bus no. 892. Take that bus and alight at Zhaitang. 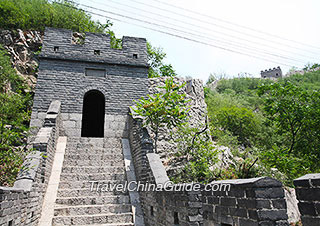 Then transfer to bus line M16 to Yanhecheng Village and start to explore the surrounding Yanhecheng Great Wall sites as well as this historical village. After that, go southwest from Yanhecheng to the rift valley at Longmenkou Village where you can admire the unique scenery of 'A Thread of Sky'. Then reverse the trip back to Yanhecheng Village and find a hostel for some rest. Yanhecheng Great Wall: Seated at the bottom of a valley with the Yongding River flowing by, Yanhecheng Pass was of great military importance during the Ming Dynasty (1368 - 1644) to prevent northern nomads to invade Beijing City through waterway. Although some watchtowers there are not connected by ramparts, the dangerous terrains also formed a complete defensive line. 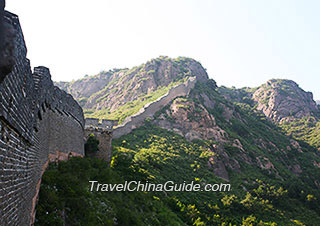 After hundreds of years, you can still find old ramparts, a few watchtowers, as well as western and eastern gates of the Great Wall remained there. Some old opera stages and buildings inside the pass also keep their original looking. Climbing up to the ramparts, you can have a full view of the village and look around the continuous mountains. A Thread of Sky: Rolling rock mountains seem to be cleaved at this place. While walking through this narrow crack, you will feel yourself very small with cliffs by your side reaching to the sky. Because of the special landscape, it has become a famous shooting place for battle scenes of TV series and movies. You can see a few stone residences as film sets at the foot of the valley. As you head deeper, you will also have a chance to see rare frozen waterfalls hanging on the precipices. Today, you are highly suggested to take a hiking tour from Yanhecheng Village all the way to the north to reach the Guanting Railway Station via Jiuzhuangwo Village. The hiking route runs along a clear river with surrounding trees and mountains reflected on the water. If going on a bright day, you will see the babbling river shining like fish scales under the sunlight. The refreshing scenery can definitely relieve the fatigue of the trip. Take a train from the Guanting Railway Station back to Beijing and you will arrive at the West Railway Station after two hours. 1. The whole hiking route from Yanhecheng to Guanting Railway Station last for 45 kilometers (30 miles) and takes around 7 hours for average backpackers to complete. 2. There is only one train departing from Guanting Railway Station to Beijing in the afternoon and it leaves at 17:30. Make sure you arrive at the train station before 17:00.